Automotive lightweight materials play an important role in boosting the fuel economy of automobiles. These materials also enhance safety and the overall performance of vehicles. The fuel efficiency of a vehicle increases if it is lighter in weight, as less energy is required to accelerate a lighter object than a heavier one. With the use of automotive lightweight materials, the fuel economy of a vehicle may improve by 6% to 8% with a 10% decrease in weight. Replacement of cast iron and traditional steel components with lightweight materials such as high-strength steel (HSS), magnesium and aluminum alloys, and polymer and carbon fiber composites can significantly lower the vehicle weight. This, in turn, decreases its fuel consumption. The global automotive lightweight materials market is anticipated to expand at a significant pace during the forecast period. Growth of the market can be attributed to increase the demand for automotive lightweight materials from developing countries. The automotive lightweight materials market was valued at about US$ 140 Bn in 2017 and is projected to expand at a CAGR of 7.2% during the forecast period. Factors such as stringent government regulations and rise in the demand for automotive lightweight materials from the automotive industry are boosting the market. Surge in the demand for automotive lightweight materials for use in lightweight vehicles is a major driver of the market. Increasing use of lightweight materials has helped achieve higher fuel economy. The factor of weight reduction is appealing for automakers, as it tends to enhance other performance factors valued by customers. Demand for vehicles is increasing at a rapid pace, especially in developing countries. Mandatory emission control by governments is a major factor driving the adoption of lightweight vehicles. Emission criteria vary from region to region. In the U.S. and Canada, these are based on the vehicle size and hence, entail the incorporation of aluminum in the vehicle body. In Rest of World, these criteria are based on vehicle weight, which leads to utilization of high-strength steel. Key players operating in the global automotive lightweight materials market need to focus on promoting benefits of using automotive lightweight materials. Major players are engaged in establishing new facilities and enter into acquisitions and mergers to develop and launch new products. These strategies are likely to propel the automotive lightweight materials market during the forecast period. In February 2018, LyondellBasell Industries Holdings B.V. entered into a definitive agreement to acquire A. Shulman, a global supplier of high-performance plastic compounds, composites, and powders. The deal was valued at US$ 2.25 Bn. In September 2018, Lanxess announced plans to build a compounding facility at Krefeld-Uerdingen, Germany in order to invest more in its global production network of high-performance plastics. By the second half of 2019, the company would be producing Durethan and Pocan engineering plastics, which are primarily used in automotive and electric & electronic (E&E) industries. Based on application, the global automotive lightweight materials market has been divided into interior, exterior, structural, powertrain, and others. Automotive lightweight materials are mostly used to reduce the vehicle weight. Automotive lightweight materials are used in various applications in vehicle interiors. The current automotive interior designs are characterized by improved component functionality and an elegant and luxurious appearance. PC + ABS and PC + ASA blends are used to generate a variety of colors, surface grains, and finishes. The vehicle exterior includes parts that can be seen from the outside. Aerodynamics, aesthetics, and ergonomics are required to be considered while designing automotive exteriors. The structural part of a vehicle includes body parts and chassis parts. Purpose of the structure is to maintain the vehicle shape and support various loads applied onto it. In motor vehicles, powertrain is the key component that generates power and delivers it to the road surface, water, or oil. Powertrain includes engine, transmission system, drive shaft, differential drive, and final drive. Based on region, the global automotive lightweight materials market has been divided into North America, Europe, Asia Pacific, Middle East & Africa, and Latin America. North America and Europe are key regions of the global market. In terms of consumption, Asia Pacific holds a major share of the global automotive lightweight materials market. The automotive lightweight materials market in Japan and China is anticipated to expand at a rapid pace during the forecast period, due to growth of the automotive industry in these countries. China is a major consumer of automotive lightweight materials in Asia Pacific. Middle East & Africa and Latin America are emerging markets for automotive lightweight materials. High demand for lightweight vehicles in these regions is fueling the market in Middle East & Africa and Latin America. Key players operating in the global automotive lightweight materials market include Faurecia, Lear Corporation, Grupo Antolin, Magna International Inc., LyondellBasell Industries Holdings B.V., SABIC Group, Reliance Industries Limited, BASF SE, DowDuPont Inc., and Lanxess. This report analyzes and forecasts the market for automotive lightweight materials at the global and regional levels. The market has been forecast based on volume (kilo tons) and value (US$ Mn) from 2018 to 2026. The study includes drivers and restraints of the global automotive lightweight materials market. It also covers the anticipated impact of these drivers and restraints on the demand for automotive lightweight materials during the forecast period. The report also highlights opportunities in the automotive lightweight materials market on a global level. The report comprises detailed value chain analysis, which provides a comprehensive view of the global automotive lightweight materials market. The Porter’s Five Forces model for the automotive lightweight materials market has also been included to help understand the competition landscape of the market. The study encompasses market attractiveness analysis, wherein material, vehicle and application segments have been benchmarked based on their market size, growth rate, and general attractiveness. 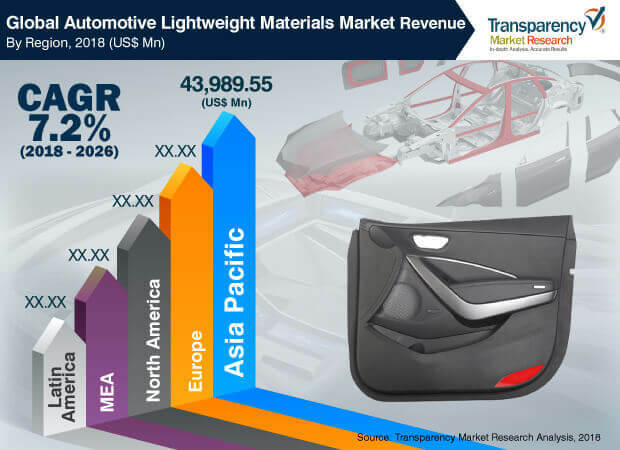 The study provides a decisive view of the global automotive lightweight materials market by segmenting it in terms of material, vehicle, and application. Segments have been analyzed based on the present and future trends. Regional segmentation includes the current and projected demand for automotive lightweight materials in North America, Europe, Asia Pacific, Latin America, and Middle East & Africa. The report also covers the demand for automotive lightweight materials in individual material, vehicle, and application segments of the market across all regions. Key players operating in the global automotive lightweight materials market are Faurecia, Lear Corporation, Grupo Antolin, Magna International Inc., LyondellBasell Industries Holdings B.V., SABIC Group, Reliance Industries Limited, BASF SE, DowDuPont Inc., and Lanxess. Market players have been profiled in terms of company overview, financial overview, business strategies, and recent developments. The report provides size (in terms of volume and value) of the automotive lightweight materials market for the base year 2017 and the forecast between 2018 and 2026. Market numbers have been estimated based material, vehicle, and application segments of the automotive lightweight materials market. Market size and forecast for each major material, vehicle, and application segments have been provided in terms of the global and regional markets. In-depth interviews and discussions were conducted with several key market participants and opinion leaders to compile this research report. Primary research represents a bulk of research efforts, supplemented by extensive secondary research. Annual reports, press releases, and relevant documents of key market players were reviewed for competition analysis and market understanding. Secondary research also includes search of recent growth trends, technical writing, Internet sources, and statistical data from government websites, trade associations, and agencies. These have proved to be a reliable, effective, and successful approach for obtaining precise market data, capturing market participants’ insights, and recognizing business opportunities.